It was not a baby who kept me awake last night, but a ten-year-old boy who tends to obsess about standings and number and brackets. He definitely needed moral support as he watched his carefully constructed bracket splinter into so much basketball kindling. He watched from Mama's bed, burying his head often into his daddy's pillow. It was late when we went to sleep. And I knew that waking would be hard. I didn't know it would be momentous. For twenty-two-plus years, my waking has been to the call of a nursling. And now, even still, that is often the case. But last night, my last baby slept through the night for the very first time. In her own bed. Away from me. She awakened happy and came to me, chattering away about breakfast and hairbows and knitting. She stirred me from sleep and pulled me by the hand and into her day. After breakfast, we sat together on the couch in the early morning light, she with her "knitting," me with mine. I looked around the room and saw remnants of yesterday's doll play, and impromptu ballet performances, and watercolor rainbows. I smiled at my yarn stash (I have a stash, really? ), newly installed in a glass-fronted cabinet repurposed for this shot of fiber beauty. So much childish good yet to play. So much growing in creativity to do together. So this is what it's like to awaken after 7 hours straight sleep? 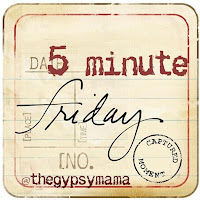 Got five minutes? Tell us about Waking Up. And then link up over at Gypsy Mama's place (you know you want to go; she has newborn baby pictures there).